January is officially half over, and many of us have already given up on our New Year’s resolutions. In fact, a study from the University of Scranton found that only 8 percent of people actually achieve their resolutions. Why is it so tough? 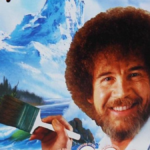 One reason is some expectations people set are not realistic. While you can try to make it a habit to eat better and exercise more, life can get in the way and make it difficult. Luckily, it’s not too late to get back on track, and if one of your goals was to eat healthier in 2019, the internet is full of clever healthy eating charts that will make it easier. From baking swaps to eating healthy on a budget and even how you can eat pizza for every meal (seriously! ), here are some of the best charts we found. If you’ve ever tried to lose weight, you know how hard it can be to go out with friends, or go to parties. When it comes to drinks, it can be almost impossible to cut calories. This chart breaks down the calories in drinks so you can make better choices when out with friends. If you can’t have dairy, are going vegan or just want to cut it from your diet, one worry may be that you won’t get enough calcium. This chart should put those fears to rest when you see all of the non-dairy foods that will give you a dose of calcium. Many foods have hidden sugar, so if you’re trying to cut it from your diet, it’s important to know it goes by many names. 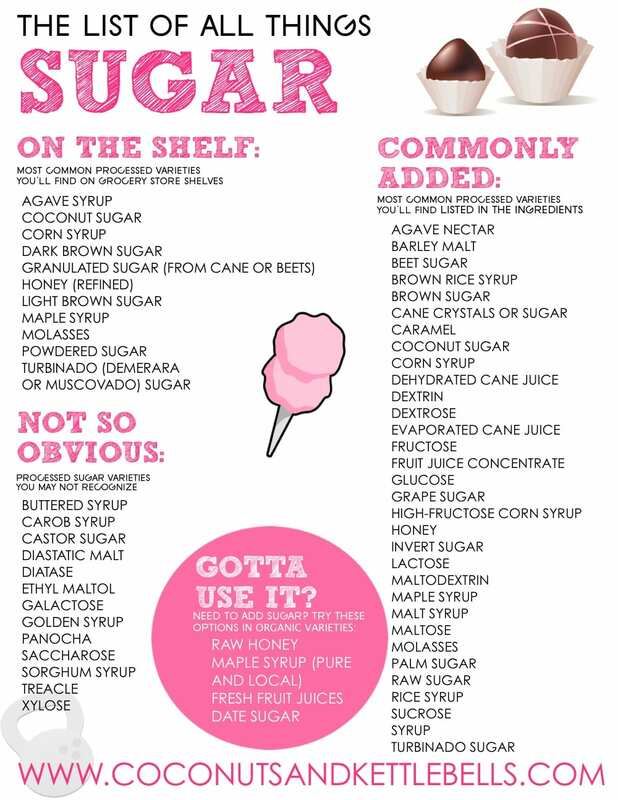 This chart from Coconuts and Kettle Bells will help you spot sugar regardless of what they’re calling it on the label. If the cost of healthy food is a worry of yours, this chart’s for you. 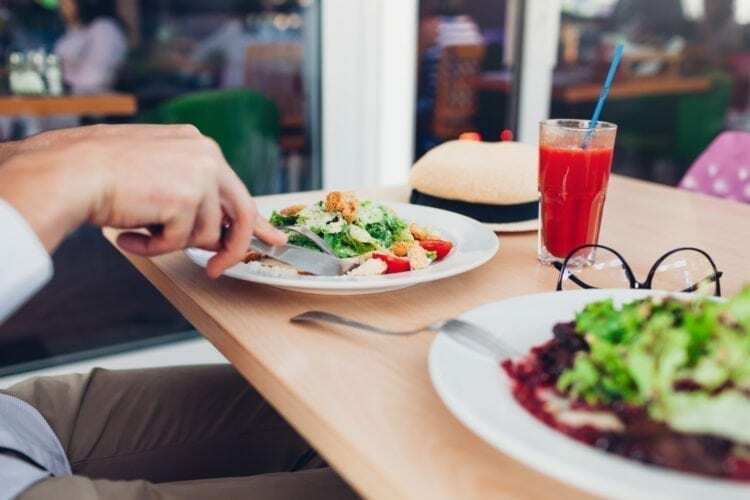 It offers some tips on how to eat healthy while on a budget. From buying frozen fruit instead of fresh to buying in bulk, you can definitely eat a bit healthier without spending a ton of money. And while this chart only lists six items, it’ll give you ideas for saving elsewhere: for example, if you’re saving on conventional avocados, why not do the same with bananas? Dessert can be one of the hardest things to avoid when it comes to healthy eating, but this chart from K.O. 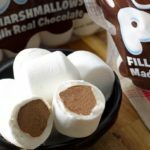 Fitness shows how you can substitute some healthy ingredients and make your treats just a bit better for you. From black beans (the flour) instead of bleached flour to avocado instead of butter, you might be surprised by some of the swaps, but K.O. 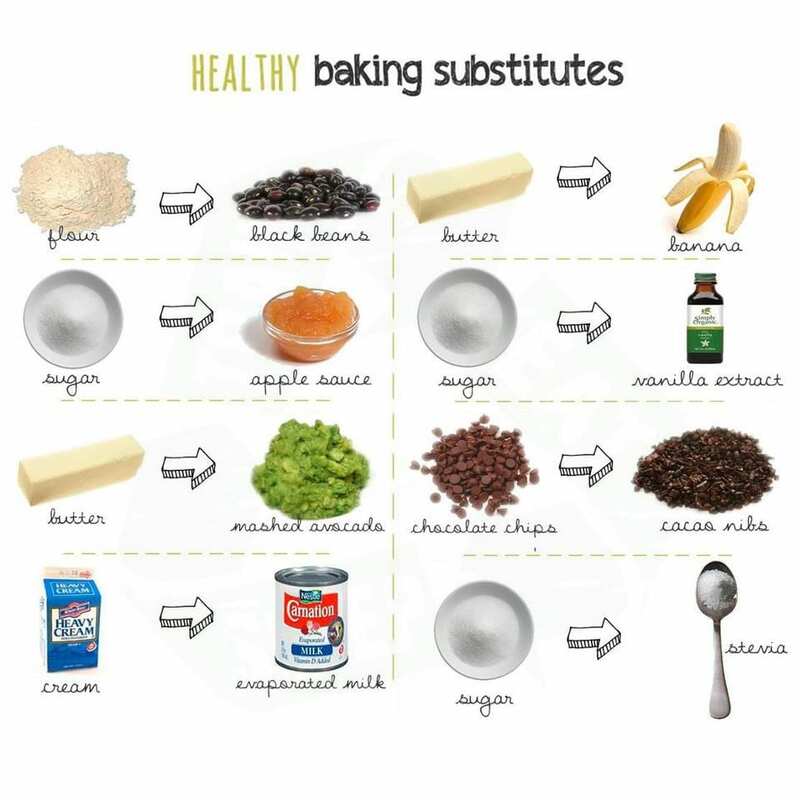 Fitness explains how and why they work so well in her post about healthy baking substitutions. If you’re wanting to cut or reduce the amount of meat you eat, don’t worry about protein. 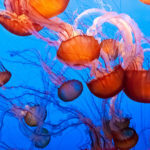 Though many people think that’s the only way to get enough, the truth is there are tons of non-meat sources of protein. This chart shows you a few to consider, though there are many, many more. 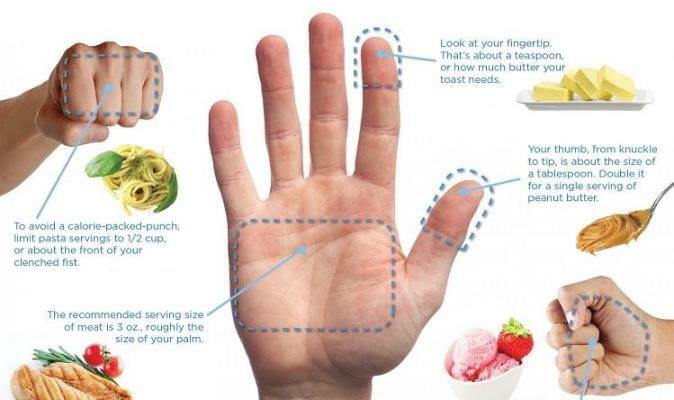 If you struggle with knowing the correct portion sizes, this chart from Medical Daily (via Guard Your Health) shows how you can use your hand to measure your food. From using your thumb to figure out the serving size of peanut butter to the palm of your hand when eating meat, you definitely don’t need a scale or measuring instruments to figure out how much to eat. Fruit is healthy, but it’s not all created equal. Dried fruit has way more sugar and therefore calories than fresh fruit. This chart shows you the difference between one of the most common fruits — a banana — but the big difference in calories applies across the board, from dried apples to apricots and everything in between. Plus, as the chart notes, dried fruit often has hidden ingredients, so read your labels. Really, it’s pretty clear which is the better choice! While nuts are definitely a healthier choice than say, French fries, their calories can quickly add up. This chart from Daily Burn shows you how many calories are in a variety of nuts, and their post on this topic has some helpful hints for serving up the right portions of nuts and mixing them with complex carbs. If you love pizza, this chart is for you! Not only does it give you an estimate of the standard calories in a regular slice of pizza, it also shows you tricks for cutting calories, such as using bell peppers or zucchini in place of the standard crust. 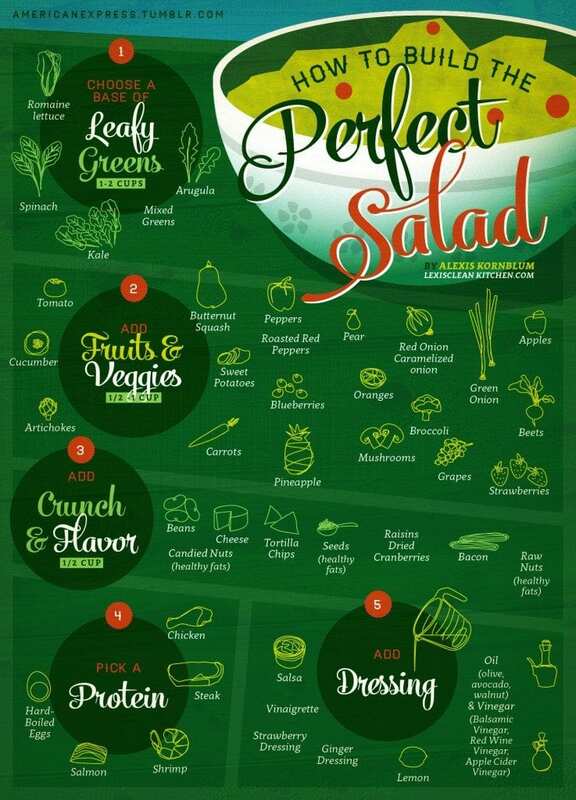 This chart from Lexi’s Clean Kitchen shows you how to make the perfect salad. From the greens you choose to veggies and protein, and even how to add crunch or more flavor, it will definitely ensure your next salad is not boring. She also includes links to yummy homemade salad dressing recipes that you won’t want to miss. This low-calorie swap chart is probably the easiest to follow, as it mostly involves food you can buy — which means you don’t have to cook anything. However, keep in mind that some items on this list are foods that registered dietitians aren’t crazy about. Some nutritionists prefer that their clients skip low-fat yogurt, for example, because the low-fat versions often have more sugar. 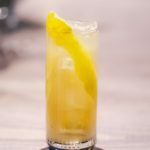 And low- or zero-calorie drinks are often loaded with artificial sweeteners — something Graeme Thompson, the Fitness Chef, acknowledges in the caption. Will you be using any of these charts to help you start eating healthier? Man eating Caesar salad and tomato juice in restaurant. Having tasty lunch. Healthy food concept.